Solid engineered wood flooring is both beautiful and long-lasting, provided that you ensure proper installation and maintain proper care over the years. 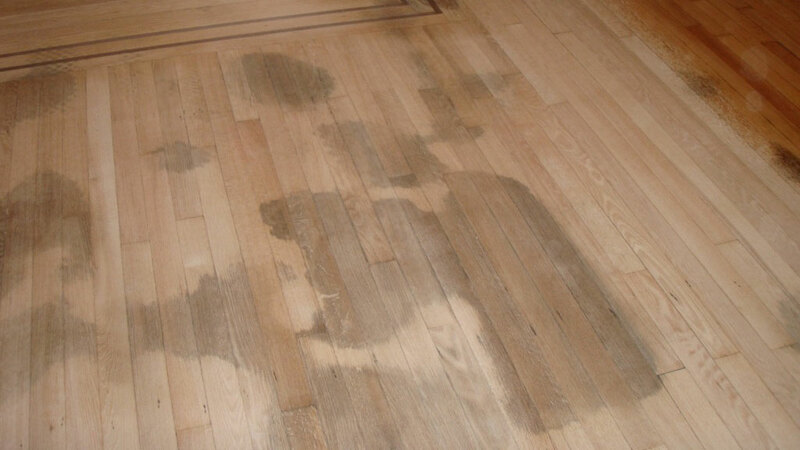 Dark spots on an engineered wood floor are often caused by water leeching in from an external source. There is a strong possibility that the floor may be saturated with water, even if the floor is not delaminating, and no cupping is evident. Check the soil line outside the house and investigate the garden irrigation. Floors installed directly onto concrete slabs could be affected by the moisture level of the concrete slab. Wet always moves to dry. If your flower beds drain toward the concrete slab, or if you water your slab to prevent cracking in summer, this could be affecting your solid engineered wood floor. The sub-floor could have been an acceptable level of moisture when the engineered floor was installed. After completion of the installation, make sure you do not introduce moisture after installation. If you have accidentally introduced moisture after installation of the floor, the floor will unfortunately need to be replaced at your own expense, since this is not covered within the product warranty and goes against proper care instructions. If your floor sits below the level of the ground, the new installation will need to be treated as a below-grade installation. Water and wood flooring do not mix. Seasonal changes affect the moisture content of a slab, and so does the grading around the house. Flooring installers should always perform a moisture test on a slab prior to installation, check the grading around the home’s foundation and educate the homeowner about what moisture can do to a wood floor.